This is like a "denier" saying "who would've though ice would melt in summer?" Who would have thought we would see normal April SWE losses in only 5 days or so? I *never* said we would see snow make it through summer this yr. I was wrong on how long it took to melt out. later on it looks as if the last bit of snow in central northern canada to the far northern east coast may be somewhat obstinate. BUT - I've a better chance of predicting what Trump is going to tweet tomorrow. So I guess the coming ice age is canceled. Who would've thought. Incorrect. It won't be this year. I didn't say it would be. But it is coming! If this year is not a black swan, the mid April SWE # is a 1,600KM^3 increase over early 2000s (2,200KM^3 vs. 3,800KM^3). When considering sea ice volume in the same time has dropped from 27,000 to 22,800KM^3, it shows an extremely rapid shift in the balance of the annual crysophere: the % that was comprised of SWE rose from 7.5% fifteen years ago to 13.5% today. It does not matter that the sea ice is dropping (or rather, this may be a direct cause of the shifting balance). But it is extremely alarming because if we see a continuation of what has occurred since 2000, ongoing wintertime ice mass loss will be accompanied by an ever-growing amount of springtime SWE. If recent trends are an indicator, by the early 2030s, SWE will take up approximately 24% of the annual balance of the cryosphere. By 2035, there will be a year that reaches 6,000 KM ^3 of accumulated SWE while simultaneously seeing an April ice volume of 17,000-18,000 KM ^ 3. Both of these figures (gains and losses) may be conservative based on the recent acceleration in stagnant weather/etc since 2011-2012. I think, at that point (nearing 2X record SWE of this year), we will begin to see severe winter impacts last far deeper into summer for prone regions, while general wintertime weather continues to worsen for the mid-latitudes. Coincidentally, or not, NYC's average snow has increased at a rate that mirrors the hemispheric adjustments since the early 2000s. If this is matched moving forward, it is likely that the city's new median/average approaching 40"+ is only going to keep rising, possibly reaching into the 60s+ by the 2030s. Cryosphere Displacement -> Loss of Sea Ice -> Gain in SWE. It doesn't have to be an Ice Age, just the delay and disruption to seeding the North American Bread Basket is bad enough. Saw on the Al Jazeera "banner" that wheat drilling has been delayed this year. This led to the Syrian Civil War after things began accelerating between the 2007 and 2012 melt events. Now we will add snowfall as another factor simultaneously worsening at a rate that is accelerating even more dramatically. The April 2018 temperature anomaly maps are extraordinary. I think it is even more telling that the comparison with 2013 in the US is extremely close (which followed the 2012 ice-out, and ensuing snows). If the events of 2012-13->2013-14 are repeated, I suspect we see an even worse SWE event next winter, and then a temporary reprieve. But if 2012-13 was the analogy to NYC's snow this winter (26.1" vs. 40.9") then we may see the snowiest winter on record next year (the same % increase would result in almost 90" for the year in the Park). I think that is very aggressive but possible given what we saw in Boston in 2014-15 and DC in 2009-10. If this is a "new normal" it also portends a possible end to the 2012-esque drops in sea ice, instead replaced by more continuous year to year momentum that still puts us on the same curve, just without as much summertime variability. That means 2012 #s are likely to begin occurring every year, but that the odds of a "Blue Arctic" event may actually be declining as the SWE input kicks into higher gear each passing winter. Rutgers monthly #s out, show similar to 4/2013. Interesting to note the Himalayas are also standing out. Perhaps the Canuck purples there aren't imaginary either. I suspect as we hurtle past solstice, the ongoing Himalayan anomaly will assist in atmospheric heat transport both to the south (ending up in Bering) and to the N (ending up in Siberian Seas). But it is extremely alarming because if we see a continuation of what has occurred since 2000, ongoing wintertime ice mass loss will be accompanied by an ever-growing amount of springtime SWE. I cannot find a science paper to support your contention that Northern Hemisphere SWE or extent is on an upward trend since 2000. Rather the papers I found seem to talk about reductions though highly variable according to latitude (& longitude?) and elevation. Recent studies of snow climatology show a mix of trends but a preponderance of evidence suggest an overall tendency toward decreases in several metrics of snow extremes. The analysis performed herein on maximum seasonal snow depth points to a robust negative trend in this variable for the period of winter 1960/1961–winter 2014/2015. This conclusion is applicable to North America. Maximum snow depth is also mostly decreasing for those European stations analyzed. Research studies show generally negative trends in snow cover extent and snow water equivalent across both North America and Eurasia. These results are mostly, but not fully, consistent with simple hypotheses for the effects of global warming on snow characteristics. (4) the snow reduction was significant in the perennial SCA in the Northern Hemisphere, including high-latitude and high-elevation mountainous regions (between 35◦ and 50◦N), such as the Tibetan Plateau, the Tianshan Mountains, the Pamir Plateau in Asia, the Alps in Europe, the Caucasus Mountains, and the Cordillera Mountains in North America. ...ever-growing amount of springtime SWE. I really expected you to lay off this nonsense. Haven't learned anything from this year's spectacular behavior. Assuming you are correct and wintertime+April SWE is on the rise in the NH - the only thing that will happen is extreme melt in May. No ice age, no negative feedback on climate. The data shows it - when wintertime snow accumulation is high, springtime melt is high, with melt-out date more or less unchanged. So if you're going to continue with these baseless predictions, maybe you should come up with better arguments. Scientific papers modelling your predictions? Specific locations where this change in melt-out into summer actually occurred? Just repeating your fantastic prediction ad nauseum gets nowhere. As expected, snow continues to melt. A slight slow-down in N. America as it is somewhat chilly in the far north and middle. Yes it's coming for sure once CO2 gets to around 200ppm, in 30k-40k years. Correct, but that spring time SWE is not even close to enough to hold the snow through summer. Not even close even at record high levels of snow fall. However it is enough to make winter miserable and the beginning of summer very flood prone. By 2030 a significant part of that water will fall as rain, not snow. However, I do expect to be below the freezing point for long enough to get lots of snow in very little time. But even if temperatures remained the same, snow at the levels you describe by 2030 won't be enough to last May, let alone the summer. Yes but the areas were the former happen will be very small and the areas were the latter happen will be very large. To say "because something is currently happening" and therefore it will continue in the future ignores what the future will entail. If we get to 6,000 KM ^3 of SWE by mid-April, we would need *3,000* KM^3 of melt in 30 days to get below 3,000KM^3 by mid-May. That would still leave something like 6-7X normal SWE for early 2000s. At that point, we sacrifice June to melt as well. There is still probably enough heat to ensure annual melt-out in most regions, but if we get to 9,000-12,000KM^3 of SWE... there may not be. Long before the latter point, harvests in the grain belts will begin failing, perhaps the collapse of agriculture/ensuing drop in aerosols from industrial collapse would be sufficient to spike global temps / cause bluest Arctic event yet / result in ensuing spiral. I think the difference can be attributed to how the recent trend is defined. Choosing a start date in the 60s or 70s, when the snowpack was deeper and more extensive, yields the negative trends, as shown in your references. However, choosing just the past thirty years, will generating a positive trend. The seasonality of the snowfall has shown greater disparity. NH snow cover has increased from October through January, but decreased from March to August. Eurasia is seemingly a bit slower to respond but in North America, after 2018, the trend in April is undeniable, I would say it has now firmly flipped from "warmer" to "colder". I fail to understand where your knowledge of the future comes from. As this is a science forum, crystal balls are not an accepted prediction method. Something is currently happening, more snow has fallen than usual this winter, and more snow has melted. In past winters when more snow fell, more snow has melted as well. You provide near certainty that more and more snow will fall, citing numbers that are 3x or 4x the current snowfall, and that May melt will not be commensurate with all that snow available to melt. These are extraordinary claims, as both fly in the face of recent trends. Instead of posting some kind of ordinary or extraordinary evidence, you cite your "knowledge". This year you claimed melt rate would be limited, and so the extra snow will have to stay on the ground. Instead we got around 700 km3 in a week, and it's not even May yet. More snow, more melt when warm weather comes. So I think you need some other source of evidence, more scientific, either based on actual data or on rigorous modelling. Is this pic not telling that there is less snow falling ? Or is my interpretation wrong. you already know that i often share your general direction of thinking but then, while perhaps you do it on purpose like some kind of a wakeup call, you usually jump a bit toooo... far and predict events that, even should they really happen which many times i believe like yourself, will happen a looootttt... later than this year or next year. as you also know i'm someone who votes for the least possible exaggeration to keep a maximum of credibility. what deniers and the greedy jump to is any missed deadline or value, hence we shouldn't feed them without need or without making an "Honest" mistake at least. So if you're going to continue with these baseless predictions, maybe you should come up with better arguments. Scientific papers modelling your predictions? Specific locations where this change in melt-out into summer actually occurred? Just repeating your fantastic prediction ad nauseum gets nowhere. Do you mean like the comment posted by gerontocrat just above yours where studies suggest a long term decline in NH snow? With 15 of the last 20 years having negative anomalies (from your chart) while 5 have had positive anomalies, this would suggest that April snow cover has been declining. Why do you say colder and warmer when using a snow anomaly chart? It is warmer. The increase in the extent can be attributed to higher temperatures leading to a moister atmosphere that even when warmer, is still below freezing. As the world warms, the atmosphere will hold even more water but the time spent below freezing get's shorter. I still expect a lot of snow to fall, but it will melt fast, just like it is melting now. In the 80's in Chicago, we would frequently have winters where snow would cover the ground for 6 to 8 weeks. This never happens now. Even when we get massive snowfalls, 15 inches or more, it has melted out in a week. It is late, so perhaps the following is written a bit awkwardly. On the sea ice threads, we talked about ice-free days some time ago. As the years go by each peripheral sea is gradually having more ice-free days as well as a lower maximum. It would seem logical that a similar process is likely to happen with snow. As the world warms the snow line creeps up the mountain slopes and creeps northwards. Snow, though it may be more intense when it comes through more moisture in the air, comes later and melts earlier or, at the margins, does not come at all. Thus it is perfectly possible in some years to have greater snowfall and less days with snow on the ground. They are not incompatible. Indeed, one of the papers I referenced said the decline was most marked by the reduction in perennial snow, i.e. snow-free days (days with no ice on the ground) were appearing in places that used to have snow on the ground all year round. That's me done hypothesising - from now on I am just going to watch it melt. The various collapse and doomsday predictions that you keep repeating are a bit boring and may be more appreciated on another forum. If you chose to stick by them please at least try to base them on some sort of facts or evidence and not just fantasies. The high SWE seems to melt out pretty quickly. Extent is within 1 SD (normal) so I think the grain belt will be safe this year as well. At least the USDA statistics show nothing more than a slight/moderate delay in the planting season. Winter wheat might even have higher yields this year thanks to the extra moisture. I'd also like to ask people to pay a bit more attention when quoting other posts, removing everything they're not responding to, and definitely not quoting comments that have quoted other comments that have quoted other comments. Grubbegraben's comment above this one is a prime example of how it should be done. If I had a dollar for every doomsday prediction that did not materialize ... Since the number one factor affecting crops is precipitation, this year looks safe. The second leading factor is temperature, which may be a slight inhibitor if the prolonged cold delayed the planting significantly. These may cancel each other out, or one may override the other - most likely the extra moisture (as you mentioned). ...and others that I am sure to be forgetting. Based on early, heavy snowfalls insulating the ground from bitter cold winter temps, could we see a more rapid warming and degradation of permafrost? What effect does early snow cover have on NH albedo? Is heavier snow fall occurring over portions of the Arctic Ocean and, if so, could this retard sea ice thickening? What are the local, regional effects of shifting snow fall patterns? I would love to see more data that measures the changes that are occurring, more like the various measures, many of them home grown, that track sea ice. One suggested above would be the trend in snow cover free days by region and some analysis of such metrics that might help answer the above questions or cause us to ask new ones. In my opinion - YES. As mentioned already the Rutgers NH snow cover value for April was 32.06 million km2 which gives a monthly anomaly of +1.84. All the months of 2018 have had positive anomalies (January only just shaded it). This April anomaly was the highest since April 2013 and was second highest in a 22 year period stretching back to next highest back in 1996. If spring 2013 is taken as a good match, well the positive anomalies were not sustained into May of that year (instead there was a -2.74 neg anomaly). 2018 NH monthly anomalies are attached - shown with recent years 2016, 2017 for comparison. Earlier in this thread I have seen some posts on snow depths from individual stations, so I was wondering how do things stand at some of the high Arctic stations ? Especially areas which have seen a considerable reduction in sea ice ? Yr.no have nice climate stats and graphs. I just had a look at the stats for Ny-Ålesund (Svalbard). It is located on the northwest coast of Spitzbergen Island. In operation since 1974. The west Spitzbergen warm current runs close to the station but since the summer of 2017 ice has been noticeably absent from the north coast of Svalbard. Svalbard has seen some of the highest positive temperature anomalies of anywhere on the globe. A quick check on the past 12 months May 17 to Apr 18 shows that the mean temperature at Ny-Ålesund was -2.0 C (+4.3 above the normal). How has precipitation and snow cover there responded to this ? The monthly precip chart shows a huge peak in Sept 17 (all rain) followed by a dry Nov/Dec period and then a snowy Jan and Feb. For the 12 month period total precip was 531mm versus norm of 385mm (138% of normal). The snow cover only got going circa the Winter Solstice (5cm lying). It went back down to zero on January 14 & 15 and then peaked at 44cm on Feb 8th. But recent cold/snowy weather has brought lying snow back up to 43cm on Apr 29th. May 1st 2017 it was 27cm. Last summer all the lying snow was gone by June 6th. (see grey/black bar chart at bottom of second chart for snow depths). It is interesting to note the cold anomalies are again expected to widen soon. But how long will that last? Perhaps as the sun moves higher in the sky for the very high Arctic, the greater discrepancy of extant snow vs very weak sea ice acts as an additional thrust to eject the PV into the continents vs. the additional solar gain in the high Ice? The date this happens is around 5/5-10. There is currently a blip in the snow melt - except for N. America snow extent which is glued to the 1 SD line. I wonder if, as peak insolation reaches/extends further N, the discrepancy "traps" the PV/etc in extant snowcover that remains before that transition occurs? (about 5/5-10 when 90N surpasses 60N), when this happens alongside very weak polar sea ice? It is interesting how much things have slowed since then. I think if we had another 500-1,000KM^3 going into mid-April, you can see how that would result in major changes wayyyyy past 5/1, especially as the proportion of the cryosphere composed of SWE instead of polar sea ice continues to rise each year. bbr I took the liberty of quoting a post you made 3 weeks ago. Bold markings are mine. Instead of the predicted 1250 km3, April ended with 800 km3. It didn't take neither May nor June nor July to resolve the anomaly, April was enough to bring it almost to the 1 SD line. You are severely underestimating the ability of snow to melt once warm weather arrives. I believe you are wrong as well, and I wish you would avoid making such wild predictions/what ifs not based on actual data. One very last thought on this subject. Cherry picking one day from an unusual year for snowfall. Arctic Ice Volume in April has dropped by 300 km3 per annum on average since 1979, and was just above 22,000 km3 in April 2018. Even if SWE does not increase from the average April max of about 3,250 km3, the ratio of SWE to Sea Ice Volume will increase, reaching about 18% (assuming sea ice loss continues at about 300 km3 per annum). Because the SWE this year in April was so high, that ratio was 19%. Should SWE increase by, say, 1.5% cumulative per annum from that unusual high max SWE of about 4,250 km3, by 2030 the ratio would be about 29%. But - so what? That increased snowfall presumably must come from higher temperatures causing increased moisture at high latitudes. But higher temperatures mean increased melt. So what would the net effect be on extent ? Shorter snow seasons at lower latitudes leading to early melt and lower albedo - positive feedback? Increased snow at higher latitudes leading to a later melt and higher albedo - negative feedback ? Without data and at least some arithmetical predictions on SWE and extent (which you have not provided), debate is fruitless. And what we end up with is hypothetical speculation of the long term impact of what appears to be a trend of increased snowfall which is what I would expect from a warming planet. More moisture in the atmosphere combined with intrusions of cold air into the mid latitudes due to the more frequent collapse of the PV results in heavier snowfalls. Lived in Chicago all of my life and we have had some amazingly heavy snowfall events over the past 5 years. In the 1980's, this snow would have been on the ground for the entire winter. We now have 18 inch snowfalls melt in a week in the dead of winter and bare ground through most of the winter is the rule. I gave you my arithmetic. Since 2000 we have seen the total volume of 29,200 drop to 26,600. We have seen the proportion of SWE since then rise, as of mid-April, from 7.5% to 13.5% (2,200 -> 3,600 KM^3). By the early 2030s I think there will be a year with ~6,000KM^3 by 4/15, or about 24% of mid-April Cryospheric volume. At that time, April sea ice will have a volume of ~17,000KM^3. The implications of this April's event are currently manifesting in projected enduring cold anomalies across Siberia and much of northern Canada. These albedo-driven fortresses of cold have now become the primary reservoir outside of Greenland in the Northern Hemisphere as solar forcing over the High Arctic / porous and mostly first year sea ice is producing lower albedoes than the continually-refreshed snowfalls over the high Tundra (post 5/5-10). It will be interesting to see if this persists until mid-July when the brunt of solar again falls on the Tundra. But I think this is another interesting thing to consider as we move into the future. As the brunt of solar insolation shifts from Tundra to High Arctic on an annual basis, do residual albedo anomalies in southern areas retain a "boost" in their staying potential, when the high Arctic is a porous and heat-sopping mess? The projected pattern would seem to argue that as our situation worsens, random weird variations like ^ begin to occur. Northern hemisphere Snow Water Equivalent (mass) is 2,000 km3 (GT), about double the average for this date. Despite this, Snow Cover Extent is only a maximum of one week behind the average schedule. Good to see that the purple snow on the Tibetan Plateau is still holding out. How many years has it been now? The purples actually went away substantially over the winter, and are only now emerging in force once more... I swear!!! 6/1 approaches... solstice 23 days from 5/28... yet the cold remains across Quebec! Perhaps it will take the second annual insolation spike in mid/late July to fully melt the rest out. And perhaps Hudson Bay will retain substantial ice coverage into mid or late August? I think early August is all but guaranteed. 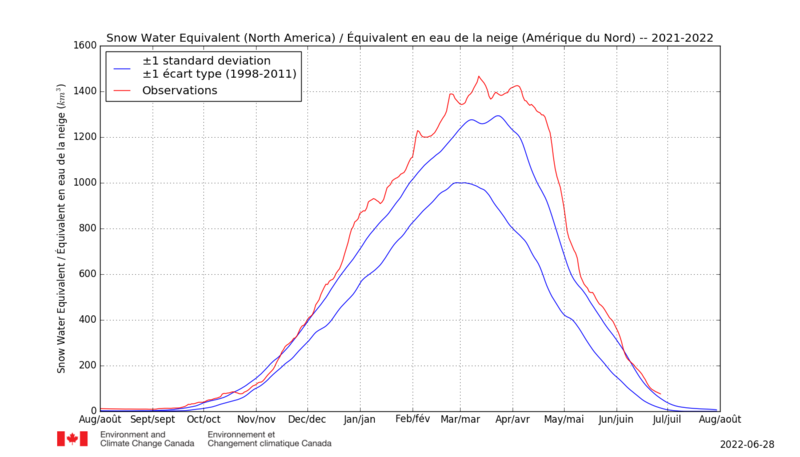 This could also artificially inflate total sea ice #s later into summer vs normal. SWE is now roughly double vs. normal once more, extent also high, but SWE is what's making a huge difference ATM RE: albedo as high Quebec/NWT are still *exceedingly* white looking at satellite imagery, with the only recent comparison being 2009 (IMO). HB is also still very snow-covered vs. normal. I like 2009 as an analog / perhaps firms the chances of a moderate-strong Nino as we head into fall and 2019. On ventusky they have 32 degree C on the edges of Hudson Bay in a few days. And a couple days later a big part of the ice is gone. The persistent cold in the NE of Canada continues to have a significant effect on the snow melt. Eurasia - while behind the average schedule is losing both extent and mass quickly. I think the 1st of June would be a good time to have another look. The persistent cold in the NE of Canada (Quebec & Terre-Neuve et Labrador) continues to have a significant effect on the snow melt extent. Now Snow Water Equivalent (i.e. mass/thickness) reduction has also slowed - the anomaly especially high in the Canadian Archipelago and Northern Quebec. While Eurasia is behind the average schedule it is losing both extent and mass quickly. GFS 3 and 5 day forecasts strongly suggest that by the end of the month there will be a lot of warming going on in parts of the high latitudes of N. America. Not to mention the recent snowfall as far as southern Newfoundland.